The Southern Glossary Instagram account is curated by a new artist or photographer each week. Every curator will put their own spin on the account, showing off work, their process, and their surroundings. Here's a Q&A with last week's curator, photographer John Kelso. I started making photographs in 2004 while I was living in Memphis, Tennessee. Walking around Memphis, I would often encounter scenes that would almost jump out at me, and finally decided to pick up an old film camera and document what I was seeing. During that time I was photographing just about everything, and because I lived in Memphis, there just happened to be a lot of beat up cars and stray dogs in the images I was making. After a while, I noticed certain themes in my photographs that I enjoyed going back to, and stuck with them. One of those distinct visions I harped over, was that of identifying myself as a Southerner through my work, and portraying the South with genuine affection and interest. After moving to Atlanta in 2006, I came to know, serve, and follow Jesus Christ. This changed the whole ballgame for me in terms of identity. I was no longer just a Southerner, I was now a Christian first, and everything else fell under that umbrella. 1 Corinthians 10:31 states, “Whether therefore you eat, or drink, or whatsoever you do, do all things to the glory of God.” I set myself to figuring out that invitation, and the work that I’m producing today is a result. My aim is to make much of God’s name by examining the Christian South, photographing different expressions of worship throughout the region. In the process, I’m able to engage with those from different walks of life other than my own, and learn to love better the very people and place that I call home. I keep busy here in Atlanta and haven’t had a good chance to meet a lot of the local photographers within the city. There are a handful of Georgia based photographers that I pull from creatively all the time and really hope to meet them one day. Two that come to mind are Michael McCraw and Maury Gortemiller. As for photo related opportunities in my area, I’m sure they are out there; I just haven’t sought after them. For the past number of years I’ve been working on my career outside of the photography world, working for an environmental company. That, along with raising my new family, keeps me pretty busy. Specifically, with documenting religion in the South, I have to be very careful to avoid the standard Bible belt stereotypes. Southern religion has been played out in movies, in books, and everywhere else, so when I’m documenting contemporary Christians; it’s easy to fall back into the visual themes that are ingrained in my psyche. That’s tough at times because most of the scenes brought about are absolutely beautiful. While sifting through these recurring settings, I always try to dig deeper into them, hoping to find new beauty in an old and predictable relationship. For the past four years I’ve been documenting the community of Sacred Harp singers in the southern region. 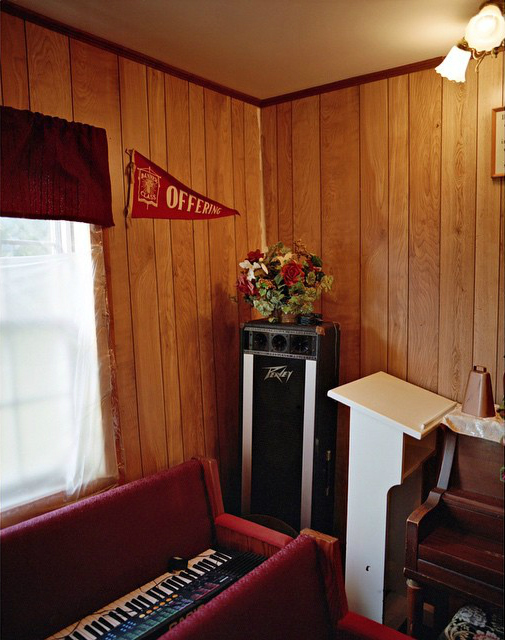 This work has continued and has since led to different offshoots within the singing community, namely, photographing a conservative religious denomination strongly concentrated in the South known as the Primitive Baptists. Currently, a single comprehensive list of all active Primitive Baptist Congregations within the United States does not exist. My current project would aim to build upon existing Primitive Baptist research here in the South and create the largest visual treasury of the Primitive Baptist denomination to date. In the South, families have preserved the spirit of the Primitive Baptist movement with great determination and zeal, always striving for grace and constancy in their efforts to remain in step with the “good ole way.” In the midst of many cultural and religious shifts, my project aims to capture the present-day demographic of its people and cultural climate of the Primitive Baptist church. This new body of work would focus on the tradition in its contemporary form, documenting the people and landscape of the Christian South, creating an important photographic record of this specific group. As a Christian, the photographs being made will not be viewed through the lens of a bystander, but seen through the eyes of an active recipient of God’s sanctifying work and power, ultimately portraying the Primitive Baptists in Gospel truth, always striving respectfully to honor the people of this tradition and way of life. I do. The Lord has been really good to me and has continued to put photo related opportunities before me that I find very satisfying.